It's quite difficult to find a good web form service that works with blogs hosted by third-parties (i.e. Blogger). Most require access to the server to upload a Perl script or some other piece of code to work so it's good to see a form generator for the rest of us. You might be wondering: why would I want to use a feedback form on my blog or site instead of using email? 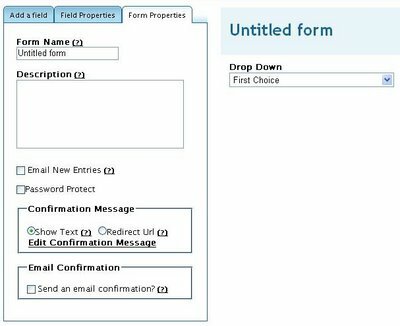 It's simple: users don't always have access to email especially when at work (accessing personal webmail accounts might not be allowed) or if they're visiting your blog in a cybercafe (might not want to enter email account information on a public computer). A web-based feedback form is a perfect solution to these problems. 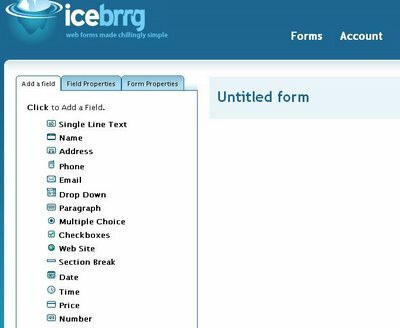 Icebrrg is an easy to use form generator. It's highly AJAX-ified, but unfortunately, it loads a little slowly. However, it's very intuitive, and it's easy to customize a form for almost any purpose (survey, feedback, poll, etc.). The drag and drop interface is nice, and you can easily embed a form in your blog or site. You can also invite users by email to leave a comment. The free account only allows 100 submissions (entries) a month though so it isn't too useful if you're expecting a lot of feedback.